All the flowers the florists in Aberdeen work with have been imported all the way from Holland, the western region of the Netherlands. Holland is renowned for cultivating some of the finest flowers in the world and we can wholeheartedly attest to this statement as our flowers are always fresh and beautiful. We receive over four deliveries per week from our Dutch suppliers so our shop is always fully stocked and our Aberdeen florists are always ready to arrange your orders. 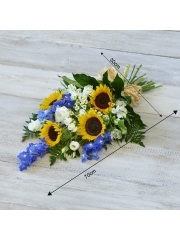 You are able to browse through our birthday flower range online to get a general feel for the sort work the florists are able to provide for you. There are many different birthday flowers from birthday hand tied bouquets to basket arrangements and everything else in between. Our designs are always bright and cheery with vibrant flowers such as germini, gladioli, lilies of varying species such as Asiatic and oriental as well as many other flowers. If there’s nothing which fully catches your eye online, don’t worry as we offer all customers the bespoke service. 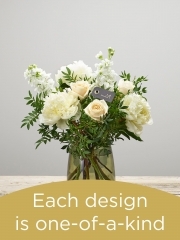 The bespoke service allows you to either tweak elements of an arrangement found online or you can work in collaboration with the Aberdeen florists to create something completely unique. You can specify what sort of flowers you would like, what sort of flowers should be avoided, colour schemes and what sort of designs you are after. Once we have all the necessary details, our team of expert florists will turn your ideas into a beautifully arranged reality. 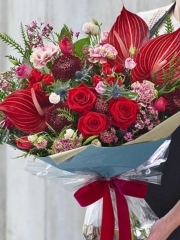 At Aberdeen flowers, we want nothing more other than to provide you with the best service which is why once your order has been placed with us, you don’t have to worry about a single thing. 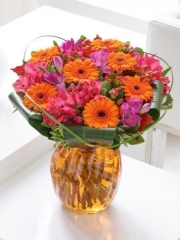 In addition to gorgeous birthday flowers, we also offer a handy gifts range. This gifts range includes a selection of delectable champagnes and wines including the likes of red, rose and white. Both these beverages are widely considered to be celebratory so both these drinks are virtually perfect for any occasion. In addition to champagnes and wines, there are fruit baskets on offer. The Aberdeen florists arrange the fruit basket on the day of the delivery with fresh fruits which are always a lovely gift. We also have chocolates and truffles on offer which simply melt in your mouth and are ideal for those with a sweet tooth. There are teddy bears in different colours also on offer as well as balloons. We are also able to arrange charming balloon bouquets which consist of three blank balloons and three with a message fitting for your specific occasion such as ‘Happy Birthday!’. 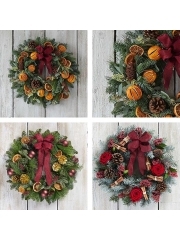 You are able to order these gifts to either accompany your flowers or as gifts on their own. 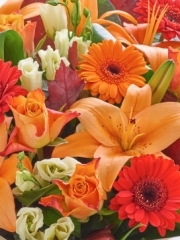 Once your order has been placed, you are able to use one of our several flower delivery services. 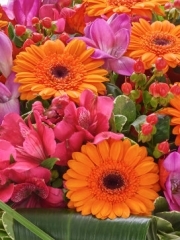 We offer the standard, next day and same day flower delivery options. All are available Monday through to Saturday, six days a week, throughout the year between the hours of 9:00AM and 5:30PM. The standard option is ideal for those who like to plan ahead as you can place your order several days or even weeks in advance whereas as the next day allows you to place your order the day before the delivery date. Our premium same day flower delivery service enables you to place your order on the same day of the delivery however please ensure your order with us placed by 3PM. This is to give the florists in Aberdeen enough time to arrange your flowers to our high standard. For any further queries, please do not hesitate to get in touch.